In an era when so many cars are trying to please everyone, the Audi A4 Allroad is a breath of fresh air. The offroad-capable wagon's mission is to convince Subaru Outback drivers (and the German SUV faithful) that, for a little more cash -- the Allroad starts at $44,000 -- you can get a much more refined package. It’s so much more than that, though. 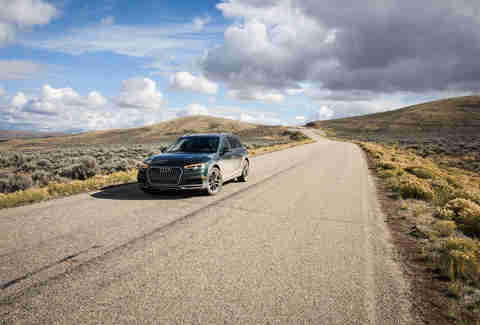 Timing, as the saying goes, is everything, and just ahead of the first opportunity to drive the all new 2017 Audi A4 Allroad in Jackson Hole, Wyoming, something unexpected happened. It snowed. A lot. 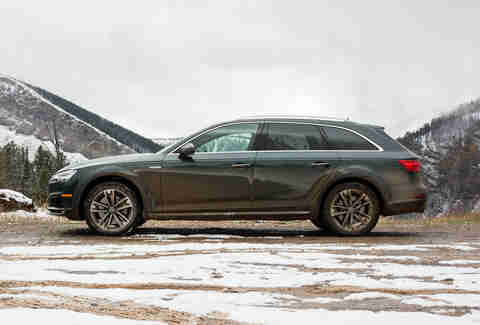 Mother Nature did us a favor, since the best way to experience Audi’s revamped wagon crossover is when driving conditions get a little messy. Would the powder prove to be a stumbling block in the face of Audi’s newest wagon? Hardly. First and foremost, the A4 Allroad is a phenomenally competent and luxurious wagon. That it’s based on the excellent 2017 A4 sedan is a point in its favor, highlighted by the Allroad’s name change (to include A4 before Allroad). 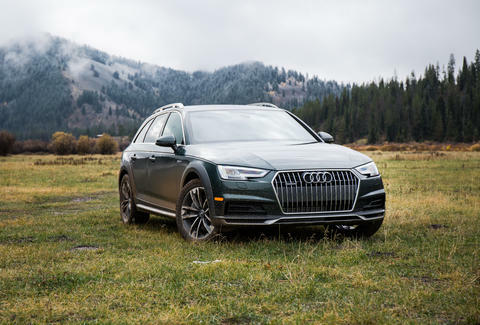 Like the Allroad Quattro that was first introduced at the turn of the century (time flies when you’re off-roading), this wagon is designed for light off-roading and staying clear in sticky situations. Its ground clearance, at 6.5in off the ground, is lower now by about half an inch, but that doesn't deter the A4 Allroad from finding and conquering rough terrain. Despite the snowfall and inclement weather conditions, we spent nearly all day over 100 miles off the beaten path, on surfaces ranging from rutted gravel trails to slick, unimproved dirt roads. Not once did the A4 Allroad crack by allowing itself to lose traction, notwithstanding attempts to make it happen. Down a slick mountain pass rife with blind corners, the A4 Allroad was completely composed; an attempted Scandinavian flick around one of them was thwarted, as was an effort to lock the A4 Allroad into a skid under hard braking on cold, wet pavement. With 252hp and 273lb-ft of torque, there’s never a dearth of power from the 2.0-liter turbocharged four cylinder. For those who care, the car goes from 0-60 mph in 5.9 seconds. Much of the credit for the car's surefooted-ness goes to the newly revised Quattro with Ultra System (a name that sounds more apt for a fabric softener, but that's OK). Most of the time, the A4 Allroad acts as a front wheel-drive wagon, but the car's computer uses sensors that measure force, steering angle, and other driver inputs to decide which wheels might need more or less power, thus improving traction. According to Audi, the system can even shift power completely rearward if necessary -- which is unusual in today's market. Audi’s best selling product is the Q5, which outsold the outgoing Allroad by a margin of nearly 18 to 1 last year. With figures like that, you might surmise that the Q5 is the superior model, but we happily disagree. Everything you get from an SUV, save for the higher-than-thou seating position, is available on the A4 Allroad. It offers 24.2ft of cargo space without folding the rear seats (that's more than a BMW X5, which is an entire size class up from the A4 Allroad, with a price tag more than $10,000 higher). Fold the seats down, and the available space increases to 58.5cbft -- more than the boffo, similarly sized Q5. 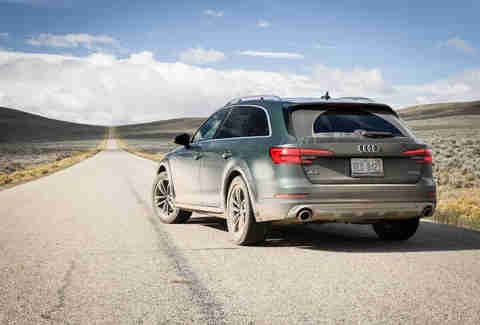 The A4 Allroad also tops the Q5 in fuel economy by three city mpg and one mpg on the highway. 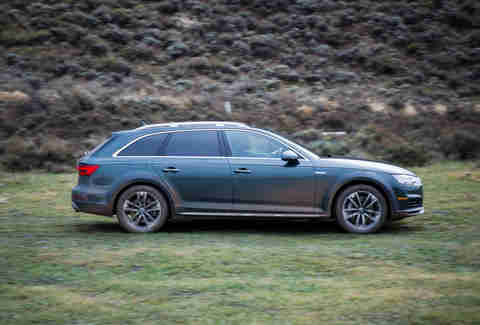 An optional adaptive suspension can firm up on demand, and the selectable "off-road" mode lightens the steering assist and disables automatic emergency braking -- so that the A4 Allroad won’t confuse a tree with a vacillating pedestrian. Think of the A4 Allroad as the apogee of the A4 family, and its most desirable configuration. There are three ways to order one, and the sweet spot is the Premium Plus model, at about $50 grand. You can go all-out and order the A4 Allroad with all the goodies, like a head-up display, but the fully digital dashboard makes a HUD largely redundant. If you appreciate technology, you’ll feel at home in the A4 Allroad, or any A4 for that matter, but the tech-allergic might be overwhelmed. The A4 Allroad drives smoothly, and is nearly silent inside, even at full throttle. It can get you out of a muddy mess, but even if you don’t live where the weather becomes disorderly, you’ll want one. The only more desirable Allroad permutation would be a 333hp S4 Allroad version, but don't hold your breath on that wagon fantasy -- at least for now, this is Audi's best A4 offering. Jeff Jablansky is a contributor to Thrillist Cars, and would totally get sideways in an Allroad -- if it would let him. Follow him over any terrain @unclewithcars.